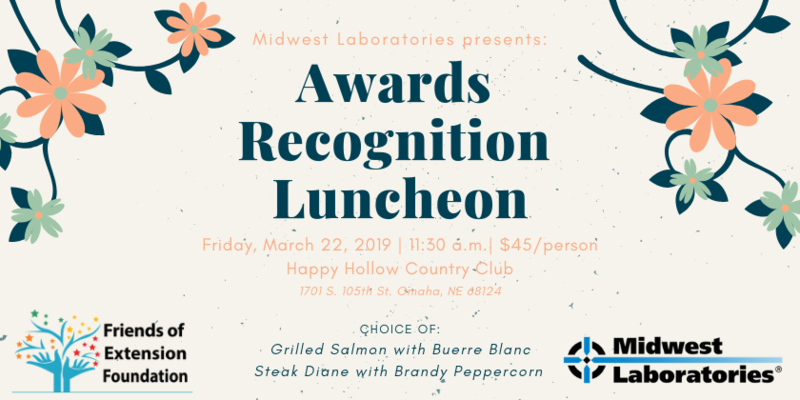 The 2019 Friends of Extension Foundation Award Honorees presented by Midwest Laboratories following in this post. Following are the bios of our honorees for 2019. We congratulate each of these outstanding honorees who have and are making an impact on our community. The 4-H Member of the Year Award is given to a current 4-H member who has been identified to be an exemplary member of the Douglas-Sarpy County 4-H Program. This 4-H member must show a commitment to the program by participating in 4-H related events, being a positive role model for younger 4-H youth and contributing to the continued success of the Douglas-Sarpy 4-H Program. This year’s recipient always greets you with a kind handshake, a warm smile, and an enthusiastic spirit. She is known for her can do attitude and accomplishments in Family and Consumer Sciences curriculum area. Her work has been selected for display in the Robert Hilestad Gallery, a gallery at UNL devoted to the exhibition of textiles. Historically, this honor has gone to select 4-H members that exhibit exemplary textile projects. She is also a former speech contest participant medaling at district and going on to win the state competition. She has been a dedicated volunteer at 4-H Festival, River City Round Up School Tour Guide, and is a former member of the 4-H Council. Her accomplishments are many, but what makes this year’s recipient unique is the way she embodies the 4 H’s, particularly through her the Diamond Clover project she leads. Through her Diamond Clover project, which was partially funded by a grant from the Friends of Extension Foundation, she committed to hosting sewing events that focused on constructing and sewing dresses for girls in developing countries. Organizing these events involved making sure folks knew how to sew, were dedicated to the project, understood the mission and vision of why the dresses were needed and the value they add to the lives of the recipients, and an overall generosity of spirit as her community rallied together to help children they would never meet. All these characteristics describe this year’s 4-H Member of the Year. It is my delight to congratulate Becca DeWilde. The 4-H Volunteer of the Year Award is given to recognize the continued devotion of their time and talents to the Douglas-Sarpy 4-H Program by helping deliver and advance 4-H educational programming. This year’s recipient is a well-known and well-loved member of our volunteer community. If you have spent any time in the livestock barn during Sarpy County Fair, you have benefitted from her service. While many folks are busy watching the show, or youth are busy preparing to enter the ring, this volunteer is steadily working to make sure the shows happen! Her vacation from work is spent creating programs for shows, and steadily entering names of winners and ribbon placements into our data management system. That sounds like a fun vacation, right? She shows up on entry day and works for hours alongside staff to enter the hundreds upon hundreds of entries that show up that day. She does so all with a gracious smile and loving spirit. In addition, she serves this great organization as a club leader. Her club now contains the children of club alums that she proudly calls “legacies”. For 29 years, this volunteer has poured her time and energy into making the best better. In addition to her time with 4-H and the fair she was one of the early board members of the Friends of Extension Foundation, helping to create the organization we see today. She has served as president of the foundation as well as treasurer for many years. She has now added the treasurer role for the Douglas County Fair. We are so grateful and so pleased to announce the 4-H Volunteer/Alumni of the Year is Lorraine Henry. The 4-H Club of the Year Award is given to a club in Douglas-Sarpy County that exemplifies the “learn by doing” model of 4-H. The club is not only active during the 4-H calendar year but is instrumental in their community. This year’s recipient has one of our largest enrollments for a community club. A 5 minute discussion with most members typically reveals how excited the member is to be a part of 4-H because of the fun they have in their club. The youth feel connected to one another, to the adults serving them, to their communities, and to the 4-H program. Members of this club are quick to volunteer for the program. They bring their animals to public events, they are the first to sign up for a new contest opportunity, they willingly share their 4-H story with anyone that will listen, they set up rooms for programs and competitions, and if a bit of advice is needed on the next steps in a program, they have the expertise to offer that advice. It should be no surprise that the Sarpy County Fair King and Queen for 2018 are members of this club. If you have watched the club members and parents and leaders of this club through the years you have seen the youth learn how to make the best, better. I am delighted to announce that the Club of the Year goes to the Country Bumpkins. Congratulations to Tracey Jones, leader, and all the members, parents, and other leaders in the club. Jennifer Haggart works at ESU #3 as the Early Learning Connection Coordinator and has over 25 years of experience in early childhood education. Her mission is to educate, empower and equip those who work in the field to be their own strongest supporters. Jennifer considers herself truly lucky to be working in the early childhood field and to have the opportunity to touch the lives of young children through the adults important in their lives. Jennifer partners with our Learning Child, Nutrition and 4-H programs to help connect early childhood educators In Douglas, Sarpy, Washington and Cass Counties with high quality Extension programs. From their Careers page: We like plants, people, and beautiful spaces. John Mulhall came to Omaha in 1953 to landscape, and now, three generations later, we are as committed as we’ve ever been to making Omaha a more beautiful place to live. Today we’re a team of a few hundred people, but our focus remains the same: working together to engage our community and share our passion for the beauty of the natural world. And we have fun doing it. Mulhall’s Nursery is a family run garden retail center that has been in business since the late 1950’s, located on 120th and Maple Sts. in Omaha, NE. The Mulhall family has been a proud sponsor of Master Gardener fundraising efforts and other Extension programming. Mulhall’s values the educational services that Nebraska Extension in Douglas-Sarpy Counties offers and sends their staff to the Professional Horticulture Series that is offered every winter. As well, Mulhall’s invites Extension Staff to present seminars at their store throughout the growing season. Along with the Community Environment team, the Nutrition and Food Safety have presented on canning and food perseveration. Mulhall’s landscape designers and diagnostic staff frequently utilize the horticulture team with the Extension Office when lacking evidence based information to respond to questions that they receive from their customers. As a result of this relationship, Mulhall’s staff respond in a similar manner to Nebraska Extension and do not shoot from the hip when answering questions and seeking out research based information. When the Nebraska Extension in Douglas-Sarpy Counties Office was facing budget elimination from the Douglas County Commissioners, Sean Mulhall was a staunch advocate on our behalf. He spoke with the commissioners advocating the importance of Extension and the services that we provide for the public and garden businesses. Since 2000, Jim has been an Extension Master Gardener in Douglas-Sarpy Counties and contributed more than 2,340 hours to the program. That’s an average of 130 volunteer hours per year! Jim is a staunch advocate of the program and is a past-chair of the Advisory Council, an appointed group that counsels program managers on issues pertinent to Extension Master Gardeners. He has also been a member of the Raffle Committee that raises funds for the Friends of Extension Foundation. Jim volunteers frequently, too, for Ask the Master Gardener tables at community events and leads the charge for the largest of these events—Omaha Home & Garden Expo and MOBA Omaha Home Show. Recently, he chairs the Marketing and Sales Committee that advocates for Extension in our community through the sales of Master Gardener-created products (e.g., calendars, cookbook, journal, plant tags, t-shirts), the revenue of which further supports the Master Gardener program. For this and so much more, Jim received the Distinguished Service Award in 2018. Robert has been with the Extension Master Gardener program since 2016. Robert leads the demonstration garden at the office where he is responsible for a crew of about seven volunteers. Robert was tasked with transforming our landscape at the office. He follows the best management practices that Nebraska Extension promotes and has gone above and beyond his role. Extension Master Gardeners are required to log 40 hours annually and Robert has logged 597 in the three years he has been a part of the program. Brian, is a great partner to the food safety program through Nebraska Extension in Douglas/Sarpy Counties. Originally from South Sudan, Christine Ross came to the United States in 1995 and settled in Minnesota, where she received her BS degree in Medical Technology at Minnesota State University Mankato. In 2005 Christine moved her family to Omaha NE to peruse a Master in Public Health at UNMC, which she completed in 2009. Throughout her time in both Minnesota and Nebraska, Christine has remained an active part of volunteering with the refugee community, using her similar experience and unique perspective to help others. Her experience and knowledge helped her identify a food access gap for the local community understanding that, “Yes there are more availability of food than were we came from, but are they the kind of food we know how to cook? Or are they the kind that we eat?” This is where the idea of growing vegetables that are familiar to the refugee community in Omaha came from. Christine also saw the important of inclusion, and that is why her project aims to include all those who came through the refugee processes, not just from one country. Christine worked with urban agriculture program coordinator John Porter, along with several other organizations, to develop the New American Urban Farmer training program. The program served 15 refugees from a variety of countries in 2018 and will expand in 2019 to include more individuals and incorporate farm business training and produce sales at farmers markets and other outlets. Christine has also founded the “Refugee Women Organization of Nebraska” a 501C3 Nonprofit organization formed for refugee women to empower, encourage, and ease integration of refugees to their new home. Rachel has worked for UNL Extension for over 10 years. She has worked in the areas of 4-H and marketing. Rachel is the face of Extension. She grew up in 4-H and knows everybody in the 4-H program in Douglas-Sarpy Counties. She has a positive attitude, she is kind to everyone. Her kids are now 4-H members and are involved in different clubs and different projects for the county fair. She is currently working in the front office area and assists with marketing. The social media & marketings presence has changed since she moved into this position. She finds new info to share with the public and works hard to get this information so the public knows what Extension is doing. Extension also says it's the "best kept secret". Rachel is helping it to be more visible. Midwest Laboratories, Inc. opened its doors for business on May 15, 1975 in Omaha, Nebraska. Since then, they have expanded into a 10-building campus devoted to performing a wide variety of analyses in a highly-regulated environment, providing the most thorough and customizable data in the industry. They are also in the process of expanding again in the near future. Midwest Laboratories’ mission has remained singular throughout its substantial growth over the past four decades. Their staff strives to provide an exceptional experience to meet and exceed the expectations of clients, all the while maintaining a close relationship with those clients to add value to their operations. They are constantly looking forward, pushing internal processes to meet and exceed new standards, gain more accreditations and provide precise and customizable data. This means working with all of their employees to accelerate the purchase of new instrumentation and develop new methods that meet the constantly evolving needs of clients. Their Management Team ensures that all systems are in compliance with the necessary accreditations and certifications to guarantee the highest quality of analysis possible. Midwest Laboratories has over 140 employees and continues to build on its rich 40+ years of service. Midwest Labs is also heavily in involved in the community. Ken has been in the laboratory business since 1964 with the exception of a two-year stint with Northrup King Seeds. Ken is the original founder of Midwest Laboratories which was started in May, 1975. Ken is still passionate about seeing Midwest Laboratories continued growth. In his spare time, Ken enjoys farm activities at Stanton Nebraska. Ken has two children: Brent and Amy and seven grandchildren. Ken enjoys attending activities with his children and grandchildren. Brent is a second-generation owner. Brent came back to Midwest Laboratories in 2005 as Marketing Director and became President in 2016. Previous to Midwest Laboratories, Brent worked at several corporations like HDR, Mutual of Omaha and Arthur Andersen. In addition, Brent has taught at the High School and College Levels. In his free-time, Brent enjoys spending time with his wife, Michele and their five children. He also served on the foundation board in its early years.